I support the Diabetes Research Institute Foundation in South Florida – which is solely dedicated to raising funds for the cure-focused research of the Diabetes Research Institute. I also support Women of Tomorrow, a charity started by my former colleagues at NBC-6 in South Florida. I have also been fortunate to travel to Haiti several times and document the work of Happy Hearts Fund, a charity started by supermodel Petra Nemcova that rebuilds schools in areas devastated by natural disasters. The Diabetes Research Institute kept me alive for many years in Miami when I was struggling in the new media environment as a freelance broadcast news anchor & correspondent. I have been a patient of the Diabetes Research Institute for over ten years, during which they helped me manage my diabetes and also gave me insulin and test strips when I didn’t have insurance. Inspired by their work and generosity, I wanted to give back and have since hosted several events to raise funds for the Institute, as well as spread awareness using my professionals skills by reporting on work of the Institute’s Scientific Director Dr. Camillo Ricordi and Dr. Jay Skyler dLife, hosting their DRI TV web series and featuring the Institute’s on several other media outlets. It’s very easy to help out. Charity can be local and about something that you relate to and know intimately. In my case, it was diabetes, which was natural for me and not planned. So, I used my position as a journalist to spread awareness about type 1 diabetes, the Diabetes Research Institute’s work, and resources for diabetics like dLife. I fell into doing more of that after doing a story for CBS The Early Show about a Greg Lemond hosted race for the cure in Colorado, and one of the CBS Producers who later went to work for dLife recruited me to help out. Getting yourself out there, participating in local charity events, and using your skills to spread awareness helps. I think that is often how this best works. Putting yourself and needs secondary to something bigger, and recognizing how you can and can’t help a large cause. My journalism in Haiti fits that bill. I won a National Emmy Nomination for a story in Haiti on hunger and ‘dirt-cookies’, which was nice, but the main part was getting Haiti seen on a national scale in the media to showcase positive efforts. Do you have any tattoos that relate to your work? I was in Israel in 2006 during the shooting War with Hezbollah for an HD Network I was working for at the time.There were a lot of international war correspondents, producers, photographers whom I met there and one who lived in war zones and had type 1 diabetes showed me or told me about his medic alert tattoo so that if he got low or in trouble people would know he had diabetes. I started thinking about it because at the time I was spending lots of time in Haiti including after the monster quake and realized something could happen to me and I could be dead in a day or two. 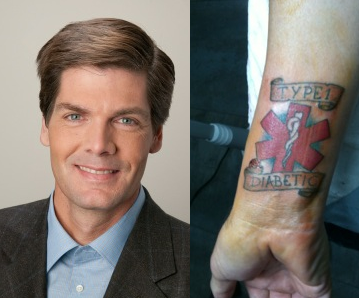 That’s when I decided to get a type 1 diabetes tattoo, which could not only be potentially lifesaving, it could also spark a conversation about my disease, how it affects millions, and how people can help. When I went to get the tattoo, I immediately thought of famed Love and Hate Tattoo artist Darren Brass – who also has type 1 diabetes and had already been on dLife, And, since I was living on Miami Beach I could just go and see him -- which I did. He was accomplished, successful, calm, informed about diabetes and Darren supported my decision as did my wife. I have no remorse about getting it, and thank god, I have never had to use in an emergency. I would like to shout out Darren Brass. He walked me though the entire process and even designed the tattoo in a very calm and helpful manner. So, I never felt overwhelmed or scared by the choice. He also explained how it had to be big enough to be seen, recognized if I ever passed out, but also added some cool design vibes in the font and style of the lettering and colors – a design that would be a sure conversation starter. Plus, he never undersold how long it would take, how much or how little it would hurt and kept me informed. I felt like I was a partner of his, not just a walk-in client. Plus, he is just a talented artist.